This seat can be adopted to suit your growing child. 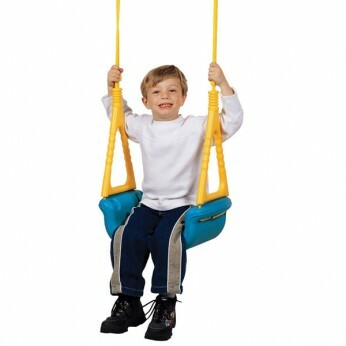 Stage 1 is a safety swing with detachable T bar and lap belt: for ages 6 to 36 months. Stage 2 swing with backrest: for ages 3 to 5 years. Stage 3 large swing seat: for ages 5 years and over. Max weight 30kgs. This toy costs approximately £24.99 (for the latest and best prices make sure you check our retailer list for the 3 Stages Baby Seat (3 IN 1) above). In our review of 3 Stages Baby Seat (3 IN 1) we classed it as being suitable for ages 1 to 3 years but recommend you check the manufacturer specific advice before purchasing.